Q: What are the primary applications for laminate paper products? A: Major end uses are durable envelopes, insurance ID cards, maps, brochures, menus, certificates, licenses, book covers, law labels, and many more. Q: Is paper/film/paper synthetic paper? A: No, it isn’t, synthetic papers are all totally plastic. A laminate paper is manufactured with real coated and uncoated papers in a unique patented paper/film laminating process. Q: Is paper/film/paper as durable as synthetic paper? A: Yes, because it is made with an inner layer of plastic film. Q: When would you use paper/film/paper versus synthetic? A: There are distinct advantages to printing paper especially for printers/converters that use predominantly paper as their main raw material. Synthetics typically require special inks, settings, plates and have prolonged drying times. Paper/film/paper is also a preferred choice for applications requiring durability where the product is not exposed to the elements for prolonged periods of time because of its printing and converting advantages and comparable durability. 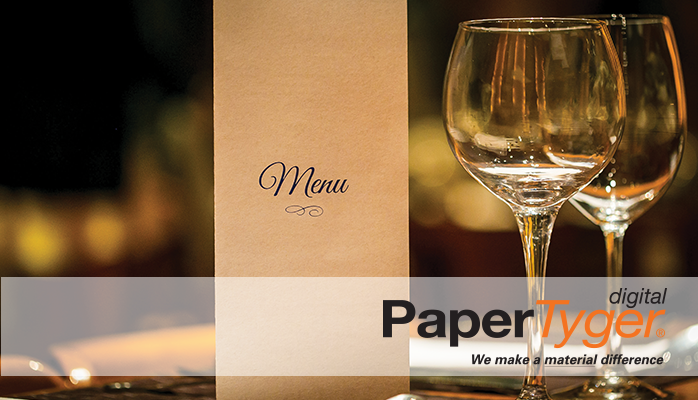 PaperTyger® Durable Paper is a range of high quality, technologically advanced, cost competitive, laminated papers. PaperTyger is a complete line of tear and water-resistant paper laminates. Products offered include premium high bright printing paper and papers for the envelope, tag, and label book publishing. Thanks to its patented, solventless laminating process, PaperTyger® looks, feels, and performs like paper with added resistance to tearing moisture, and greasy substances. The papers are high white, wood free and FSC certified coming from responsible sources. A significant advantage of the PaperTyger® range over other durables is the ease of printing and converting. No special inks or setups are required and no prolonged drying times compared with synthetic materials. Guaranteed for digital, laser and offset printing. A result of the patented paper/film/paper laminating process that delivers the toughness of a synthetic sheet with the benefit of an uncoated paper printing surface. PaperTyger® products are designed for short-term exterior applications from uncoated papers with wet strength from protection against moisture. A polymeric film in the laminate which is naturally grease resistant. PaperTyger® has a proven excellence with guillotining, sheeting, and trimming, folding, perforating and many more techniques, as opposed to many other durables and synthetics. PaperTyger® products are suitable for a wide range of applications; where the integrity of the material is paramount at a cost-effective price point. Manufactured by a patented, unique, solvent-free laminating process, all PaperTyger papers positively contribute to a range of applications where durability is required. Visit PaperTyger to view our whole product range and discover the right product for your digital printing needs.